An evening designed to create a candid conversation about leadership, life balance and legacy. 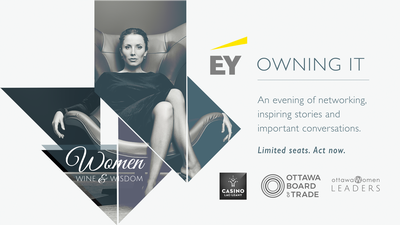 Enjoy a beautiful dinner, share real stories and be inspired by powerful women known for “owning it”. Invite all the fantastic women you know; those with ambition, courage and a desire to live their truth. Invest in a young woman who will make a difference because she met those who were willing to lead. Registration closes on Friday, June 7, 2019. Due to special menu, late registrations cannot be accepted. Sponsorship opportunities available to Ottawa Board of Trade members. Contact Sueling at sueling.ching@ottawabot.ca for details. Contact Sueling at sueling.ching@ottawabot.ca for details.